I thought it was about time to get away from wedding posts for a bit, before my blitz of posts regarding the Royal Wedding that seems to be taking over. As much as I hate to give into the trend, what kind of event blogger would I be if I didn't address it? Stay tuned throughout the week for posts about the biggest social event of the decade. I'm sure that you've heard the phrase before, "That was the best restaurant in the world" - and perhaps you've even used it yourself. S. Pellegrino's "World's 50 Best Restaurants" brings on a whole new meaning to that. What also makes this unique contest unique is there isn't necessarily a checklist the judges need to fill out in order to make their decision. You can learn more about this process here. What peaked interest in the judges for this restaurant was partly the variety of the food - you can find everything from sea urchin and dill, potatoes and milk skin, beef cheek and pear. They're not about the olive oil and sun-dried tomatoes and olives, but rather the bringing the best raw materials from the Nordic regions back to Denmark. Sounds to me that could make for a pricey night out. 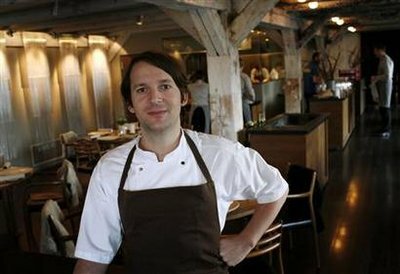 Not only is it a pricey night out when you visit Noma, but make sure you have the time to spend. Their twelve course "experience" (yes, 12 courses!) takes more than 4 hours and needs to be ordered before 8pm. They call this the "voyage of discovery". Personally, this contest is something I'm interested in learning more about, and I'm somewhat disappointed that I wasn't aware of it earlier this afternoon (thank you Yahoo news feed). I would have loved to know about some of these places during my European travels. I think I'll start buying the annual book that is published with the top 50 winners so that on my next travels, I know where to go.